Nate was depressed as an early teen. His skinny frame looked unhealthy and the weight room intimidated him. See how he busted barriers and added 50 pounds of muscle! 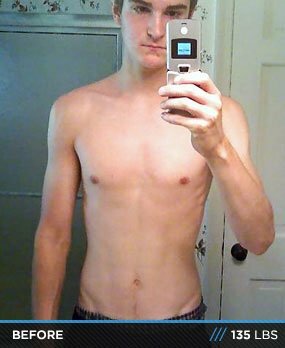 I was 17 years old when I first started lifting as an extremely skinny teenager. I looked in the mirror and was shocked at how thin, gaunt, and unhealthy I appeared. So I decided to do something about it. Due to my emaciated frame, I had a severe lack of confidence that lead to issues with depression and anxiety. I always admired the physiques of bodybuilders and fitness models; the girls loved them, and the guys wanted to be them. I had the power to do something about my physique. At first, I had no clue what I was doing in regards to training and dieting. Being the smallest kid in the weight room was extremely intimidating. I discovered Bodybuilding.com one day and stayed up for hours taking in all the information I could on training and nutrition. I officially started lifting around age 16, but it wasn't until age 18 that I really learned what works for my body. A basic five-day lifting split coupled with a diet high in protein and carbs yielded the best results for me. Through strict and consistent nutritional practices and intense training I was able to add significant lean body mass to my frame the right way; naturally. Proper diet is an integral part of any body-specific goal, whether it's weight gain, weight loss, or athleticism. My fast metabolism made adding size a long and difficult process. But learning to eat for performance and long-term benefit versus short-term satisfaction contributed to paramount changes in my physique. Here's my sample diet for lean mass. It's about 4,000 calories per day. I may add a seventh meal depending on how long I stay up for. I simply try to eat a good amount of protein and carbs every 2-4 hours and will always drink at least 1 gallon of water per day. Through trial and error, I found what works best for my body is a program focusing primarily on progressive overload. That is, constantly trying to out-perform my last training session by lifting more weight, performing more reps, or using intensity techniques like drop-sets, forced reps, supersets, rest pause, and decreased rest periods. The basic premise is simply hard work in a smart manner. If you aren't giving your body a reason to change by creating the stimulus through hard work, then why would it? Below is a sample training routine that I use. While it's a basic indication of what I typically perform, I'm constantly switching things up, so no claim of precise repetition is made. The most challenging aspect of my transformation was the frustration that occurs from plateaus. There will be times when you feel like you're making no progress or regressing. When this happens, you must remain mentally strong. Working out and eating correctly is the easy part. Remaining mentally strong in times of distress is where the challenge lies. Where the mind goes, the body follows. After I graduate from college this year, I plan to start my own personal training business and get involved in fitness modeling. I also plan to compete in the men's physique division in 2013. Be patient and don't read into negative feedback from others. You are your maker and you have the ability to accomplish whatever you desire, provided you're willing to put in the sweat equity and deal with sacrifices along the way. If I believed the people who told me I couldn't do this, I would have quit a long time ago. There are times when you will be your biggest obstacle, but that's a false belief. I will leave you with a quote my father showed me when I left for college that I apply to every aspect of my life, whether it is a heavy set or a difficult exam. I hope that someone else may appreciate it as I have. Bodybuilding.com was the first fitness-related website I ever visited back in 2007. The site has been an integral part in my transformation and I continue to visit it regularly. The articles, forums, and videos are an excellent outlet for motivation and information on the latest trends in the industry.